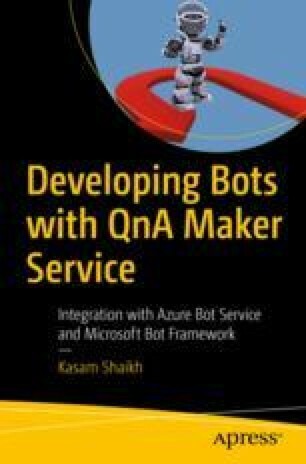 In the last chapter, I talked about the bot backend, called the knowledgebase in the QnAMaker ecosystem. In that chapter, you created a knowledgebase from the Apress FAQ URL content source, which is a publicly available sample Word file with a few questions and answers. You also added a few questions and answers manually as a part of the Editorial section. And later, you learned how to make it public by publishing the knowledgebase and creating a RESTful endpoint to connect to it. In this chapter, you will see how to make the knowledgebase talk to the bot framework, which is the Azure Bot framework.